With the summer movie season coming to a close, let’s discuss one of its last offerings – The Hitman’s Bodyguard! IMDb summary: The world’s top bodyguard gets a new client, a hit man who must testify at the International Court of Justice. They must put their differences aside and work together to make it to the trial on time. The Hitman’s Bodyguard was written by Tom O’Connor and this picture was only his second screenplay to be produced. The script had both fun and dumb moments. The set-up, as well as the shared backstory of the protagonists, was good, while the dialogue and the banter were actually quite funny. The movie also had way more emotional depth than I expected it to. However, the antagonist was quite awfully written. I’m really over Eastern European politicians or mob bosses as villains in Hollywood films, mostly because I’m from that region but also because American screenwriters tend to reduce them to cinematic caricatures instead of portraying them as actual real-life threats. The fact that the writers (or somebody behind the scenes) thought that they needed to clarify that Belarus used to be a part of the Soviet Union with that sub-heading was kinda sad too. The Hitman’s Bodyguard was directed by Patrick Hughes, who also did The Expendables 3. The influences of his previous picture could certainly be felt in his current one: while the last of The Expendables films was an intentional homage to the 80s actioners, the critics can’t really pinpoint the exact decade Hughes was referencing with The Hitman’s Bodyguard. I saw it being called ‘a love letter’ to both the 80s and 90s, but to me, it felt like an early 2000s action film, especially because of the split-screen opening sequence. The hand-to-hand combat was choreographed quite well, while the car chases were also entertaining and exciting enough. The soundtrack by Atli Örvarsson, full of well-known old-school pop songs, was a fun addition to the film too. The movie actually had two very enjoyably-cringy musical moments – the sing-off between Reynolds and Jackson and the nun bus scene. Another humorous sequence was Reynolds’s monologue to the bartender with action happening in the background (it wasn’t the most original but still a well-executed sequence). 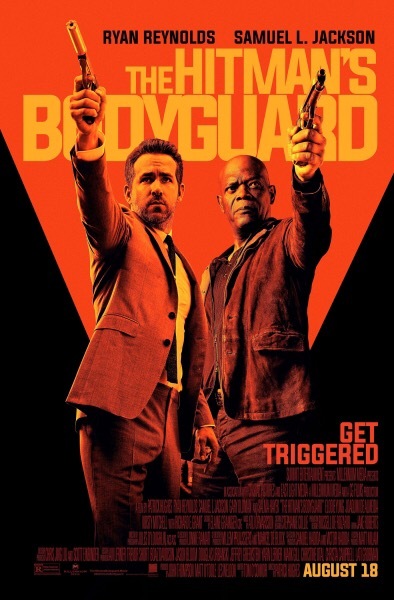 The best part about The Hitman’s Bodyguard was its two leads – Ryan Reynolds (Life, Deadpool) and Samuel L. Jackson (Avengers, The Hateful Eight, Kong, Tarzan, Miss Peregrine) and their amazing chemistry. It was interesting seeing Reynolds trying to play ‘the straight man’, while it was also fun to see Jackson going absolutely crazy, even though he has done that before, for example, in Kingsman. Jackson has appeared in a tonne of films lately, I wonder whether the audiences will get bored of him or whether he is actually priceless in a supporting role. Elodie Young played Reynolds’s love interest and did a nice job. She had a very good weekend, with not only The Hitman’s Bodyguard hitting theatres, but The Defenders (where she stars as Elektra) landing on Netflix. Salma Hayek (Sausage Party) had a tiny but hilarious role as Jackson’s love interest, while Gary Oldman (Dawn), for whatever reason, played the main caricature of a villain. Joaquim de Almeida also had a cameo role and an important plot-point was kinda spoiled by his involvement in the film (he just usually plays two-sided characters so I was fairly certain that he will be shady in this movie too). In short, The Hitman’s Bodyguard is predictable but an entertaining enough action comedy that has a very expendable villain but is elevated by its two leads.